In February, we published a blog post requesting our current customers and potential customers to ask us any questions you may have about our business. This month, we answer some of the most frequently asked questions we received. The questions keep coming! Over the last few weeks, we've received several more questions related to our apps, devices, and online therapy platforms. Below are our answers to a few of the questions received. Don't see your question below? Don't worry, we'll be posting additional questions and answers in future blog posts, and you can submit your own question on the form at the bottom of this post. A. Hello, Eileen! The short answer to this is "yes"! In fact, the majority of our users cannot read or write due their brain injury. Neither reading nor writing is required to use the device functionally for communication. Our program uses an icon- and picture-based system, which allows our users to make message selections by choosing the icon/picture. For example, they may have an icon of a bathroom, which says “I need to use the bathroom” when they select it, or they may have a picture of their son that says “My son is Michael” when they select it. In order to customize the device, typing to add text will need to be done to name the icon and attach the message to it. This is where the trained communication partner comes in. 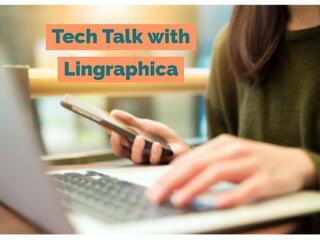 When an individual gets a Lingraphica device, his/her family and primary communication partners are trained on how to customize the device to create new icons and messages for their loved one to use. I hope this information was helpful! 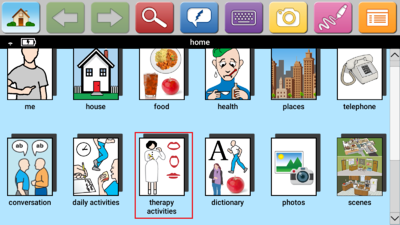 Step 1: Click on the "Therapy Activities" icon on the home page of your device. 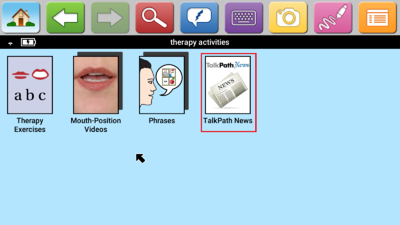 Step 2: Click on the "TalkPath News" icon in the Therapy Activities section. 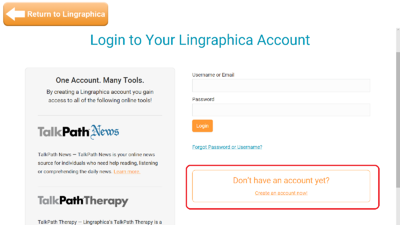 Step 3: Click the "Sign in" button in the top-right corner to access your TalkPath Online account. Step 5: Select a news article you would like to read and enjoy! A. Hi, Ben! Thank you for submitting your question. That is difficult to answer because every person who uses our devices has a difference experience with them. Some may find them easy to use, while others may find them more difficult. When creating the software for the devices, we try to have the users in mind. We try to consider how people are going to use our devices and what they might find useful. Everyone communicates differently and has different lifestyles. Our devices reflect those different preferences with various sizes, icons, and methods of communication. The video below highlights some of the various features our devices offer. If you think a communication device would be a good fit for you, we offer free device trials! 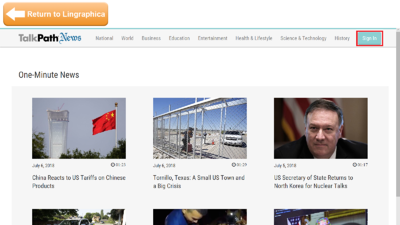 Additionally, we also offer free communication apps, free online therapy exercises, and a free online news source. 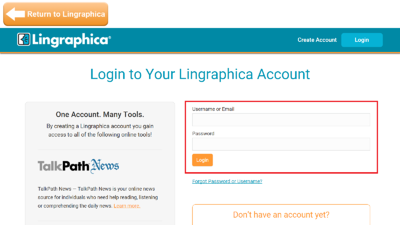 Do you have a question about Lingraphica's products? Fill out the form below and we'll answer your question as soon as we can. We'll also post our answer to your question in a future blog post!